Wiser’s newest retail solution can help retailers maximize their inventory’s potential with competitive insights. 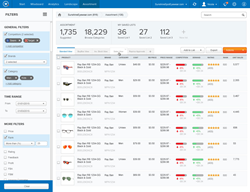 With Best Seller Assortment, retailers can now take the guesswork out of assortment discovery and merchandise planning and use analytics to stay competitive and profitable. Today, Wiser, the premiere retail price intelligence and repricing engine, announced a new addition to their collection of retail solutions called Best Seller Assortment. It will help retailers plan their inventory better by continuously monitoring important categories across different marketplaces, such as Amazon. With the competitive insights that Best Seller Assortment provides, Wiser enables retailers to optimize their inventory by adding only the best products to their stores. Wiser's Best Seller Assortment helps retailers refine and optimize assortment management. From there, Wiser integrates advanced analytics, such as market price intelligence, popularity trends, and overall product volatility metrics to identify the most popular products for retailers to add to their assortment. Finally, by integrating cost estimates, retailers gain a clear line of sight into the most profitable additions to their catalog. Armed with this intelligence, retailers can make more profitable decisions with their vendors and double down on growing their businesses. Learn more about Wiser’s Best Seller Assortment here.